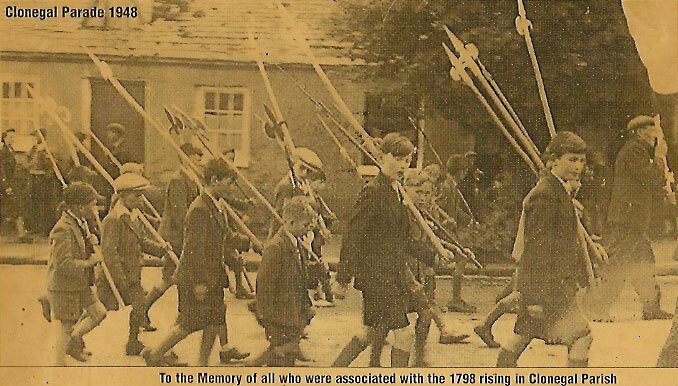 The above photograph was taken in 1948 at the parade in Clonegal to commemorate the 150th anniversary of the 1798 rising and was published in the Nationalist and Leinster Times in May 1998 on the occasion of the 200th commemoration of 1798. Photo supplied by Johnny Dunne. Clonegal developed as an Estate Village in the 17th century. The Esmondes of Huntington Castle had ambitious plans for the village but they ran into financial difficulty. They had family tragedies, younger sons took over and the estate was sold piecemeal. Therefore, only one side of the village was built, which is of course to our advantage, because we have a clear view of the river. The Inn, with its own Venetian window, was a posting house and developed with trade. Eventually it was a hotel. Osborne's was part of the old Inn. It is now called The Sha Roe Bistro and still looks after visitors. Clonegal House dates from the early 17th century. The front has Georgian features but the back is 17th century with its garderobe towers and huge gable chimneys. It would have been the home of the Agent for the Castle. Huntington Castle has been continuously occupied since the 17th century when the original fortress was converted into a dwelling house. The avenue of lime trees date from 1680 and the limes came from France. The Yew Walk is 600 years old and reminds us of a time when the place was a monastery. Built in the 18th century, these cottages are the oldest dwellings in the village. We know they were weaver's cottages because of the roof windows to provide more light. Clonegal had one of the biggest frieze fairs in the area. We sought the aid of Carlow County Council and with their help and that of FAS, the cottages were reopened during Heritage Week 2000 and great crowds came to watch weaving, spinning, bread and butter making. Storytelling and traditional music sessions took place there until the crowd became so large that they had to move to St. Brigid's Hall. This project received a Gulbenkian Trust Award and the ESB Award in 2000. Mentioned in The Down Survey of 1650, The Bridge is a tapestry of stone in the different styles of stone building. It was rebuilt in 1780 after a flood. The top of the old bridge can still be seen at ground level. This house was a shop and bakery. The bake house is still in tact. The family have recently renovated the adjacent Coach House. This fine Georgian building was the residence of the Rector of the Church of Ireland and is a focal point in the village. The house is the property Ms. Melian Robertson. The rear of the house is slated against the prevailing wind. In the 19th century this was a RIC station. In 1898 the gable was plastered to make a ball alley. In the 20th century it was converted into a shop. It has been restored by its present owner. The walls are random rubble and it has granite quoins. The G1aslakin slates, the half dormers and the original chimneys make this an architectural treasure. In 2008 the owner restored the gable and put up a plaque. The information given on the historical significance of these buildings came from a lecture by Dr. Kevin Whelan and the information on the architectural features came from Mike Ryan. The 19th century was a time of chapel building. Around the chapel, shops and schools were provided and so it was with Clonegal. P.J. Dunnes is a fine example of that period, note the slated gable. This church was built in 1824 at a cost of £1,000. The truncated granite spire is unique. It is believed that Thomas Cobden, who was at the time building Carlow Cathedral, may have had some influence on the architecture. The sanctuary with its Corinthian columns and broken pediment is worth seeing. The plaster ceiling is the work of visiting Italian craftsmen. The upper and lower cemeteries date from the early 1800's and are very well looked after by the Parish and FAS. This building was originally a school. Brigidine Nuns taught there and lived in the adjacent house which was their convent. This building was restored in 2007 and the school children are using it again, this time with computers instead of slates and chalk. Built in 1835 this building was a meeting place for a community of Methodists which gave two brothers to the ministry in 1887. It was closed at the end of that century. It is listed. The Bangor slates were imported for the roof. Its new owner has restored it and has done a beautiful job. This gothic church was rebuilt by John Bowden in 1819 in First Fruits style. The site is from the early Christian period 5th century. The mound was first surrounded by a deep motte and enclosed by a rath. St. Fiaac was believed to have been ordained by St. Patrick. The centre window on the north side is by Harry Clarke. The oldest gravestones in the area are in the adjoining cemetery dating from the late 1600's. Restored by the Historical Society, this well dates from the 19th century and always supplied the Easter water. These pumps were erected in 1896 to supply water to the village. We have made a feature of them. This building dates from 1877 and was a grain and wool store. It is now a shop and is located opposite Clonegal House. The Built Environment - in the 20th Century. Located at Riverside, the Pig Weighing House was build in the 1920's. On market day the pigs were weighed there. The weighing machine was also used to weigh cattle, timber and corn. It was in use until the late 1950's. Our committee, with the aid of The Barrow, Nore and Suir Development, cleaned up and drained the Pig House. We put in a slide for children and commissioned some pictures from a local artist, Clare Dunne. In 2010 we commissioned a plaque with the history of the Weigh House from local artist Ken O'Brien. 1938 The 1798 monument at the Bridge. The garage with the stepped gable in the Watch House. This was built in 1945. The builder needed a garage for his lorry. Money was very scarce so he bet on a greyhound called Sunny Glen and luckily the dog provided the finance to build the garage. The National School was built in 1952. The Health Centre/Dispensary was built in 1950's. It has recently been sold and is now a private residence. Valleyview was built in the 1970’s. The New Cemetery on the Tullow Road dates from the 1970’s. Only 30 new houses were built in Clonegal during the 20th century. The Grotto (near Moyacomb Meadow Estate) was built over an old village well in the 1970's. The Ben Mulhall Memorial Park, on the Shillelagh approach road was built in 1999. 1995 “Abha an Doire” (in the Watch House Village) was the squirrel motif to remember the legend about a squirrel traveling from Shillelagh, along the oaks, without touching the ground. This was a first monument. 1995 The Watch House Name Stone donated by A. Kinsella. 1996 The Clonegal Name Stone (in the centre bed) donated by P. Hickey. 1998 The Forge Stone Monument in the Watch House to remember 1798. 1998 "Sos cois Abhann" at Riverside, donated by Coillte. 2003 Two houses were built adjacent to the Weaver's Cottages in 2003. Nine houses were built in a development called Watch House Village in 2003. Twenty nine houses were build in the centre of the village at "Moyacomb Meadow". Three houses were built in "Radharc na Doiri". 2000 Name stone for St. Brigid's Church, on the Carlow Road, erected by parish. 2000 Pig Sculptures in granite by Martin Monk to remember the function of the Pig Weighing House at Riverside. 2000 The Wildlife information board erected by the Tidy Village also at Riverside. 2000 The Clonegal Goat by Rupert Till in the centre bed, erected by the Tidy Village. 2000 The Sculpture of the Hounds of Fionn Mac Cumhall, also by Martin Monk, to remember the old name of the parish "Magh Dha Chon" - Fionn and his hounds were said to have rested here when they were chasing Diarmuid and Grainne. 2000 Name Stone on the new wall of St. Fiaac's Church on the Tullow Road, erected by the parish. 2000 The Sli Na Slainte Map Board in the park was erected by our committee. 2001 The name stone for St. Brigid's Well on the Carlow Road erected by the Historical Society. 2002 The sculpture of the warrior, donated by Martin Monk, in St. Brigid's Terrace. 2012 A seating area at the riverside is being donated by Mrs. Bridie Murphy in memory of her late husband Mr. Peter Murphy (RIP June 2011). The riverside area was a favourite of Mr. Murphy's, having been born in Clonegal 88 years ago. Mr. Murphy kept a life-long interest in his home town of Clonegal, Co Carlow. Mr. Peter Murphy will be remembered for his farming shows on Radio Eireann including 'Country Call', 'Meet the People' and 'Around the Country'. He will be best remembered for his TV shows 'Landmark' and 'Cross Country Quiz" which were broadcast on RTE throughout the '70s. Between 1973 and 1988, Mr. Murphy compiled 14 quiz books based on the programme. All were bestsellers on publication. Although officially retired from 1992, he continued to act as a quizmaster at events across the country and he compiled crosswords for the Farming Independent, Sunday Independent and Farmers' Monthly. At the Watch House a granite seat was placed in memory of Lena Kealy by her family and friends (RIP December 2011). Lena was a dedicated member of the Tidy Village Association and cared for the Watch House area with great affection. The seat is inscribed “Come sit with me a while and think of good times past”. 2013 The year of the Entente Florale European Competition. A community garden was constructed on Main Street. The centre bed at the Green was re-designed and planted with roses. The shrub bank at Watch House Village was re-fashioned and re-planted. The derelict houses on Main Street were given a face lift and painted in heritage colours. Holly and Oak saplings were planted along the river bank and Oak saplings were also planted at Watch House Village. The Weaver’s Cottages garden was restored to its original state due to the dedication of John Halpin who was awarded “Local Hero” for all his voluntary work on the project. The Wicklow Way Map Park was re-constructed and paved providing wheelchair access.